Donald Trump took to Twitter to complain again. But that's not news. Today, however, he took umbrage with Vanity Fair's recent review of his Trump Grill restaurant, written by Tina Nguyen. The review, published Wednesday, was full of undeniably sick burns on the Trump Tower establishment. The author said that the "bathrooms transport diners to the experience of desperately searching for toilet paper at a Venezuelan grocery store" while linking to a Vice video on the Venezuelan food shortage crisis. She also documented how the steak filet was "slumped to the side over the potatoes like a dead body inside a T-boned minivan" and that it "might not have even been a filet at all." Trump, expectedly, did not take kindly to the review. 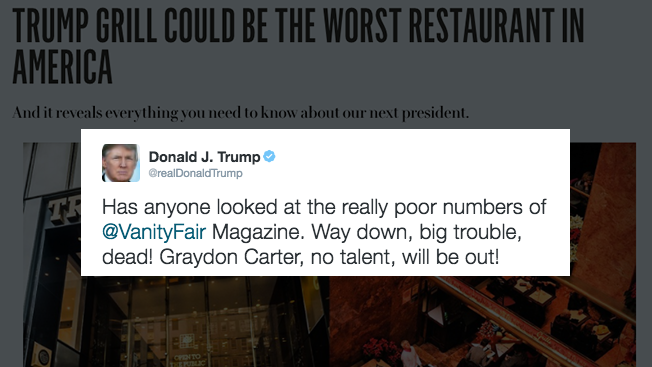 He used it as an opportunity to poke Vanity Fair's editor, Graydon Carter, once more. He also "slammed" Carter four years ago in a tweet, according to CNN Money. The review isn't the first time Vanity Fair has poked the bear in Trump Tower's lair. Carter himself has used his pages to remind readers of Trump's less-than-perfect hand size, reminding readers that he'd called Trump a "short-fingered vulgarian" in Spy magazine more than two decades ago. Whether it's poor restaurant reviews or Saturday Night Live impersonations, the President-elect has been using his Twitter account just as much as before. Which means that other Twitter users are also quick to point out criticisms like Nguyen's biting review. This comes at a time when many are concerned about a variety of topics surrounding Trump's looming presidency, such as the Russian security probings into the election, Trump's tepid approach to security briefings, and how he could possibly stay in command of his many businesses. To Trump, a very smart person, the darn media keeps getting it all wrong, especially that "no talent" Graydon Carter.